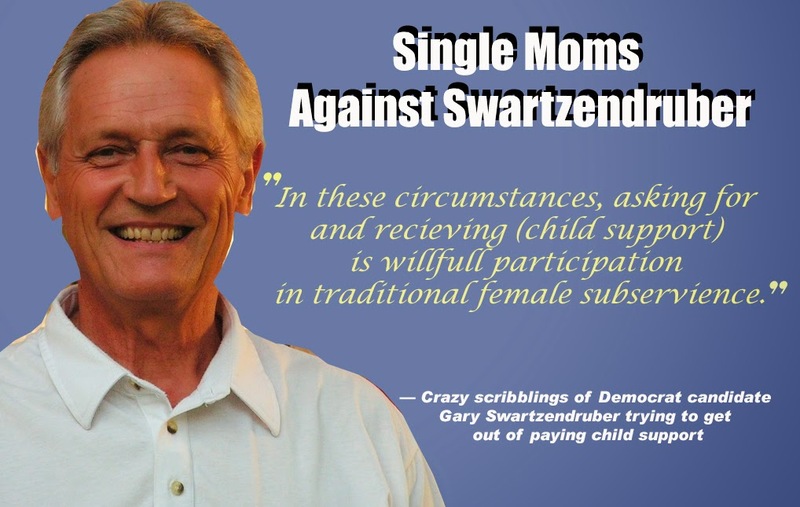 Oh, there's a War on Women Single Moms in Salina, and the Major General leading the charge is none other than Democrat Gary Swartzendruber. I received an email this morning detailing how this so-called supporter of women did everything short of Susan Smithing in order to avoid paying child support. Gross. The Judge in his child support case was not impressed. "It is clear that (Gary Swartzendruber) has consistently avoided financial contribution..." the Judge wrote. In a ghastly move, the Democratic candidate threatened to cancel government grants for his own son if the judge ordered that he pay child support. He threatened not to provide information for his daughter's financial aid applications. "The Court is at a loss to understand (Swartzendruber's) apparently mean-spirited 'trade-off' that if he is ordered to pay support, he will someone retaliate through cancellation of his son's PELL Grant application and Stafford Loan and refuse to participate in applications for his daughter," the Judge wrote. Um. Grants and loans in his childens' names cost Swartzendruber nothing. Swartzendruber faces Republican J.R. Claeys in the general election. The House race in Salina is a dangerously tight, I hear, and as of this afternoon, I have yet to see the Salina Journal or any of the local media there reporting on Swartzendruber's War on Single Moms. If Democrats manage to squeak this one out, I never want to hear another word about the so-called War on Women. Between this guy and Paul Davis' Strippergate, I think it's pretty clear which party values women and cares for the welfare of children. Typical, liberal bias. They'll trample over their grandmothers to run dirt on a Republican, but when a Republican uncovers court documents that make a Democrat look like the slime ball he is, those journalists leftist shills can't be bothered to write or run a story. The truth to the release is that it was written by JR Claeys himself, who is the opponent of Swartzendruber. That makes it a little "dirty"... and biased, like you said. JR has his own sullied reputation and needs to change the message away from the fake green certificates he sold to businesses while living in Washgington DC and the 1/2 a million condo in Lawrence he owns and brags about while he claims to live in his sister's basement in Salina. Even his family in-laws claim he lives in Lawrence. The inside of this story is that JR Claeys is in trouble with his candidacy due to his own behavior, so he writes and pawns off a story about his opponent and family using a 30 year old divorce record. Another example of the Claeys' "version of truth".